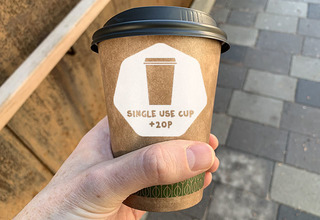 Following our successful trial last semester, we are introducing a new 20p levy on single use cups from SU outlets, to encourage use of reusables. We’re committed to sustainability. We want to lead the way with schemes that make us consider the impact we have on the environment, whilst rewarding those who help us reduce this. Only 1% of the 2.5 billion single use coffee cups used in the UK every year are recycled. Using a reusable cup is a small step we can all take to reduce unnecessary waste. The new levy is being introduced alongside our existing 20p discount for customers using reusable cups. It means customers using a reusable cup instead of a single use cup save 40p! Join our Campus Cup scheme for a refundable £5 deposit. You’ll receive a band which you can show at our outlets to receive your drink in a reusable campus cup. Return the cup once finished and keep the band for next time. If you want to leave the scheme at any time we’ll give you your deposit back.